Since Memorial Day was yesterday I thought my recipe would play on the spirit of that day. 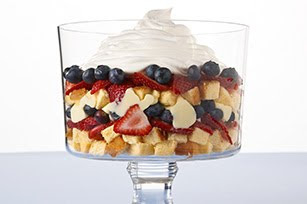 This is a very yummy dessert and would be great any time this summer but would be perfect for July 4th with the red, white, and blue color scheme. I, of course, like many others, got this from Kraft Food-- surprise, surprise! Enjoy! -Beat pudding mix and milk with whisk 2 min. -Place half the cake in 3-qt. bowl; top with half each of the fruits. Spread pudding mixture over fruit. Repeat layers of cake and fruit. Top with COOL WHIP. -Refrigerate 1 hour. Refrigerate leftovers. Yum, I'm going to make this for a family get together on July 17th. Love the blog and just became a follower. Thanks so much! And enjoy your treat when you make it! It's super yummy! I love my Trifle bowl...ever make death by chocolate? O M G!~ is all I can say. I have made this one too....love it so much.